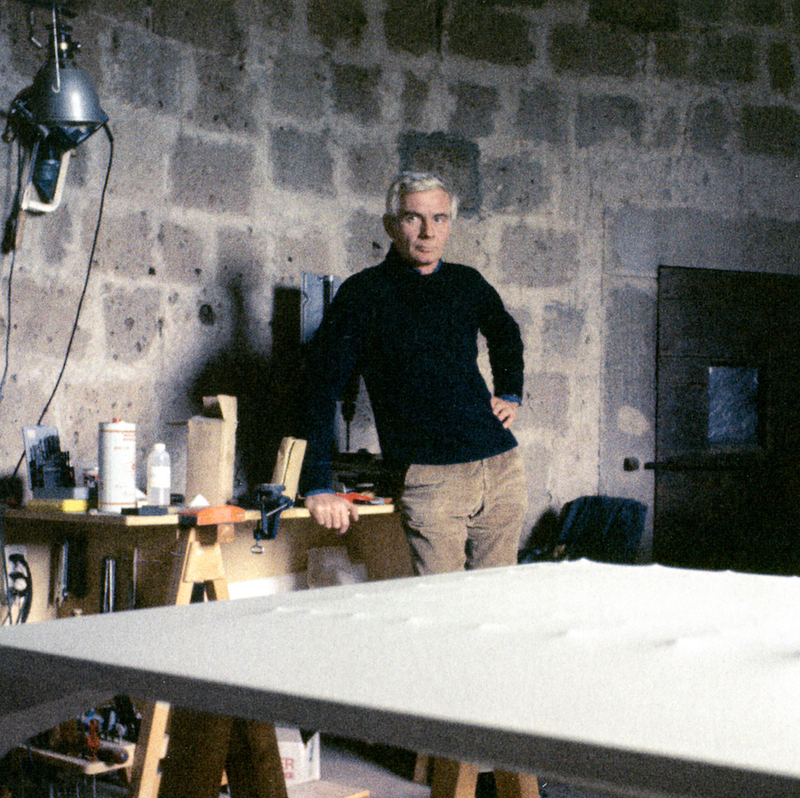 Enrico Castellani in his studio, Celleno, ca. 1977–78. Photo: Franco Pasti. FOR MANY YEARS the painter Enrico Castellani lived in Celleno, an isolated and extremely beautiful village north of Rome, where cell-phone service is only intermittent and the trattorias await groups from outside the city walls or the occasional wedding celebration to see new faces. Almost a hermitage, it precisely reflected his character, so secure was he about his own work that he had no need to speak about it. He might perhaps have preferred to say something about a centuries-old rose garden growing on the terraces of the half-ruined castle he inhabited, or about the fate of small bookshops in Orvieto, rather than to speak about the art scenes in New York or London, although for almost twenty years he saw them through their best known protagonists. But even his recent success (recent with regard to the chronology of his work, which came to maturity around 1959, when he was not yet thirty years old, after a period of apprenticeship) had not dissuaded him from the rigorous discipline that characterized his entire life. And yet he had all those opportunities for being distracted by the intensity of encounters, places, and situations, beginning in postwar reconstruction Milan, at the Bar Jamaica, where, with Piero Manzoni and Agostino Bonalumi, he talked about how to make an art magazine that took their work into account. This was Azimuth, recognized today as an achievement of the avant-garde despite the fact that only two issues came out, printed in just a few copies by a typographer friend who hung out at the same bar. The adventure continued with his artistic success in the early ’60s and with his political engagement in the ’70s, but with the same reluctance seen in the way he clearly delineated the private, social, and art spheres. This hesitancy had taken a direction he would never abandon, almost as if the apparent repetition of gestures on the surface, continued throughout his life, sealed the meaning of the work, valid in and of itself, as solely an inner discipline. Inspired by Lucio Fontana’s energyas was everyone in the 1960s and ’70sCastellani found his strength in testing out and constructing ever-changing relationships between surface and light, through protuberances on the canvas that, depending on the light’s angle of incidenceor, if you like, through the passing of the hours and the elapsing of timeimperceptibly altered with every glance. His is an art of contemplation that diverged from the action of the art world that had rediscovered him in the mid ’90s, at a time when he had essentially reduced the range of his colors, all rigorously monochrome, to white, silver, and the occasional red and blue. Nevertheless, this was not a search for a degree zero of painting but, on the contrary, for the infinite potential of the union of a few elements, which one might now describe as sanctified and united by the perseverance of underlying daily labor, tireless and silent. Marco Meneguzzo is an independent curator based in Milan and a lecturer at the Brera Academy of Fine Arts.